Successfully Added Eclipse Pro - 2.1 Android Phone 3.2 Inch Capacitive Touchscreen to your Shopping Cart. PRICE BREAK! The world’s favorite mobile OS, Android 2.1, is now finally available in one of the sexiest and most affordable smartphones to date- the Eclipse Pro. Now with a new and improved capacitive touchscreen! To say that we’re extremely excited here at Chinavasion would be an understatement. That’s because for the first time ever we’re able to offer you the latest Google Android 2.1 smartphone at the lowest price possible. More on how we made that happen later. Now let’s get to the good stuff! The Eclipse Pro comes with everything you need to manage your busy lifestyle, stay entertained, and keep you connected with friends, family and clients. Highlights include: high speed WiFi internet access, Google maps, worldwide GSM connectivity, MP3/MP4 player, Gmail integration, Micro SD slot and tons of preloaded apps like Wiki Mobile, Facebook, Yahoo, eBuddy and more. The Eclipse Pro uses a bright and colorful 3.2 inch capacitive touchscreen that responds quickly to even the slightest touch of your fingertip- absolutely no pressure at all is required! Just like an iPhone you can glide your finger across the screen to scroll through web pages, eBooks, photos, and more. But unlike the iPhone, the Eclipse Pro has a conveniently placed scroll ball for pinpoint accuracy when navigating through the menu system, emails, webpages or photo albums. And since this phone uses the latest Android 2.1 operating system, everyday task like sending and receiving emails, checking the latest weather and news reports or simply staying connected with your Facebook buddies is now easier than ever before. 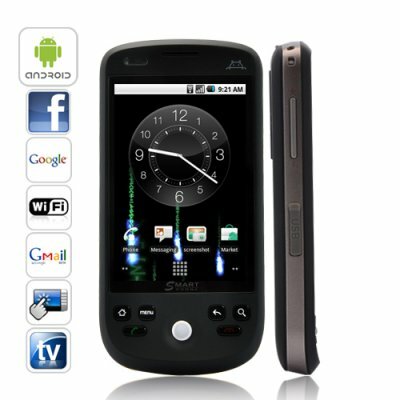 Comes with Facebook, Twitter, Gmail, Yahoo, eBuddy, Weather, Wiki Mobile, Google Talk and much more! The Eclipse Pro smartphone is in stock now, ready for express delivery and comes with our full 1 year warranty. Available only from the leaders in wholesale Android phones, Chinavasion! Facebook Application: Keeps you connected with friends and family and automatically syncs your contacts' Facebook photos into your contact list. Simply awesome! World’s Best Gmail Mobile Client: Now supports multiple accounts so you can get personal and work emails, contacts and calendars- all in one interface! Live Wallpapers: Animated wallpapers that really make this phone come alive. Choose from dozens of eye popping visuals such as the super cool Matrix theme, lightning bolts theme, neon lights and many more. Imved Photo Album: Makes it much easier to access and share your photos on the web. Simply select a photo and with one click you can send it to Facebook, Twitter, Gmail or MMS. Additional Home Screens: Gives you five home screens to fill with shortcuts and widgets as you wish. While Chinavasion continues to grow as the #1 Chinese electronics wholesaler, so does our relationships with China’s top factories. That’s why we're confident that you will not find an Android 2.1 smartphone of this caliber for such a low wholesale price- anywhere. Just search Google to see for yourself. If you don’t own an Android smartphone by now then you really owe it to yourself to experience all the Eclipse Pro smartphone has to offer, at this price you really can't go wrong. Order now though because at this price supplies are expected to go fast. Is this a an original Android Cellphone?